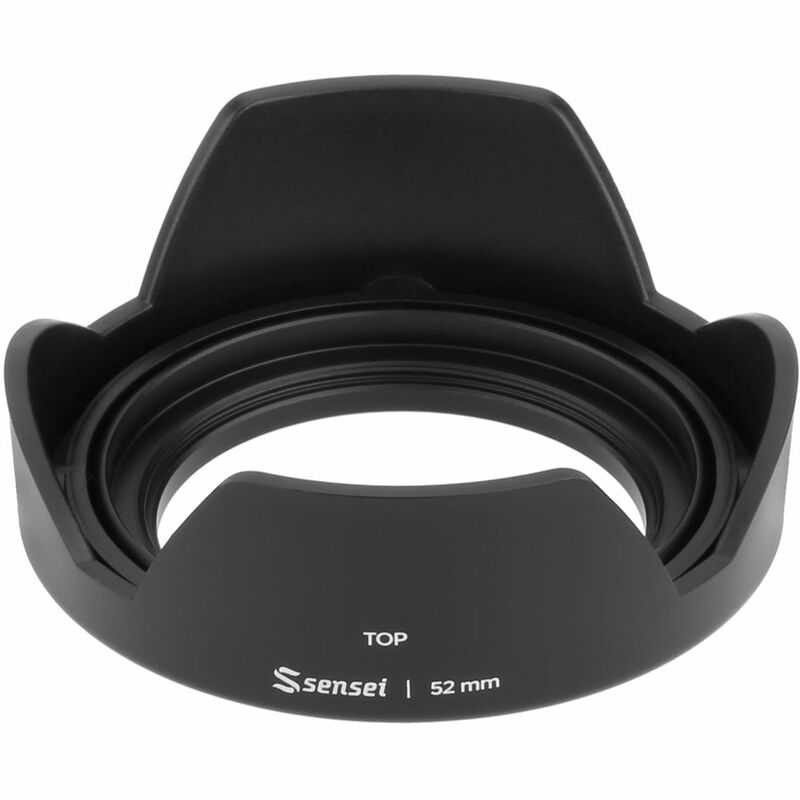 This Sensei 52mm Quick Clip Lens Hood is designed to mount quickly and easily onto your camera lens to prevent lens flare in your images. This two-part design allows you to leave the threaded ring on your lens and easily clip on the hood when needed, or easily reverse the hood when you find it unnecessary. This lens hood is for use with internal focusing lenses and non-rotating filters, and accepts center-pinch lens caps. To avoid any vignetting, the Quick Clip is best used with lenses above 20mm for 35mm format and with lenses above 15mm for APS-C format. In addition to keeping stray light out, it can help protect your lens and minimize accidental damage from everyday use. Box Dimensions (LxWxH) 3.6 x 3.4 x 1.7"
52mm Quick Clip Lens Hood is rated 4.5 out of 5 by 6. Rated 5 out of 5 by MH from This is a very nice lens hood. I like this lens hood much better than the screw-on version. It appears to be very secure yet easy to reverse when you want to put your camera in the camera bag. Rated 5 out of 5 by Charles from I know its wide but.... …. I bought this for the EF 40/2.8 pancake lens. Cheaper than Canons hood, and better, as Canons hood barely blocks any stray light. This is a much taller hood, and even then, it does not cut off or darken anything in the corners. It snaps on, snaps off, reverses for storage if you like. The Canon cap will work with it in the extended position. Rated 5 out of 5 by Garen from Good Product Fits my Canon 35mm lens. Shade is made up of two parts. A ring that screws on the lens. The shade itself push/click mounts on the lens. The ring is firm when threaded on. The shade will rotate around the ring. If the shade is not required, it can be pulled off or reverse mounted. Fit and finish is well designed. Rated 3 out of 5 by John from Too short for 50mm lens This lens hood could be better. It was bought to go on a Nikon 50mm f1.8D lens. The shade is too short for the lens. It is also difficult to take on and off when shooting. I would not buy it again. Rated 5 out of 5 by Colin M. from Great hood! Great lens hood. For the price, it can't be beat! Solid construction. will it work with the Canon RF 35 1.8 STM?